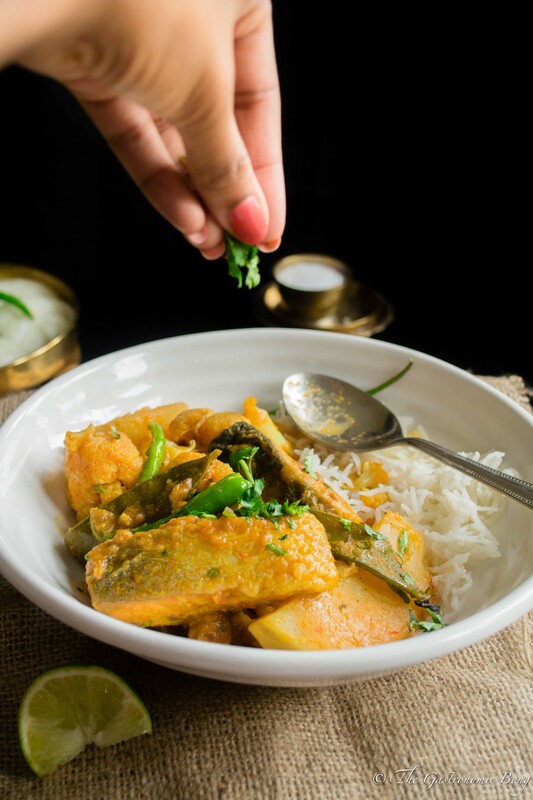 Salmon Curry With Cauliflower And Potato (Fulkopi Aloo Diye Macher Jhol) is a light and soupy Salmon fish curry loaded with fresh veggies like cauliflower and potatoes and flavoured with warm and earthy spices like cumin and turmeric. Its the start of the week and lets start it with a healthy and delicious Salmon curry recipe. As I said in earlier, hubby has been travelling a lot lately. And travelling means consistently eating more outside food. So when he is home I try to prepare healthier and nutritious food. And this Salmon curry is just that. Its a huge and difficult task to get him eat fish. So I have to prepare it in such a way that suits his pallet. Earlier I had made this Salmon in Yogurt Gravy (Doi maach) a delicious bengali dish, which to my surprise, hubby really did cherish and devour. Doi maach is something I make quite frequently at home. And now about this Salmon Curry With Cauliflower And Potato (Aloo Fulkopi Diye Macher Jhol), another popular bengali dish, prepared in almost all bengali households. I have all grown up eating this fish curry with rice. 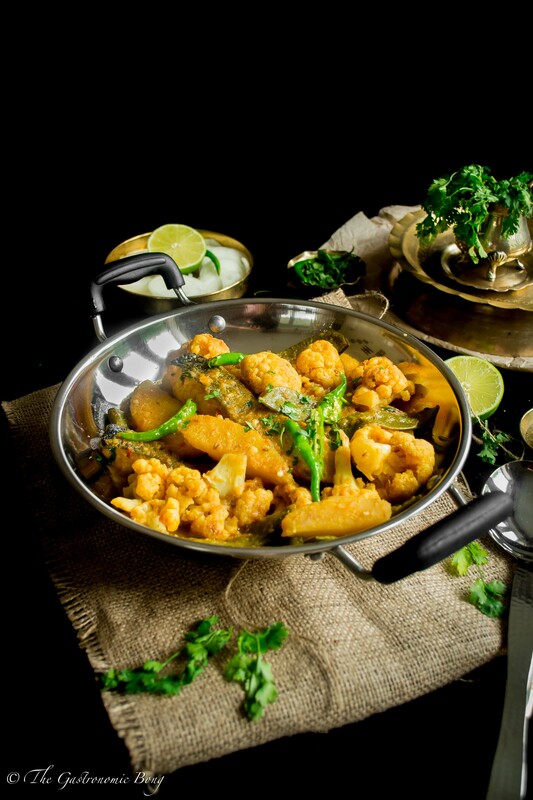 We usually make this cauliflower and potato curry with Rohu fish or rui maacha a species of fish of the carp family. But since rui maach is not readily available here, I make it with salmon and it is equally delicious and flavourful. I was really sceptical whether hubby will like this dish or not. And Yes.. You guessed it right! He loved it. 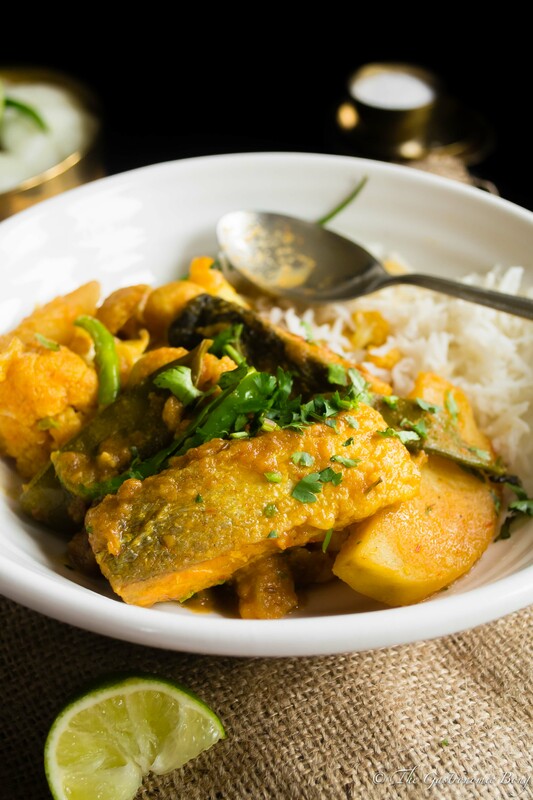 Well there is nothing to dislike about this fish curry or maacher jhol as we say it in bengali. This salmon curry is very delicious as its made with fresh veggies. Loads of fresh vegetables like potatoes, tender cauliflower, fresh tomatoes and loads and loads of fresh coriander leaves are added to this dish. I have even added some fresh mangetouts in this curry too. So if you are a fish lover or not you are surely gonna love this Salmon Curry With Cauliflower And Potato (Fulkopi Aloo Diye Macher Jhol). This dish is super simple to make and can be served with Rice or Rotis. 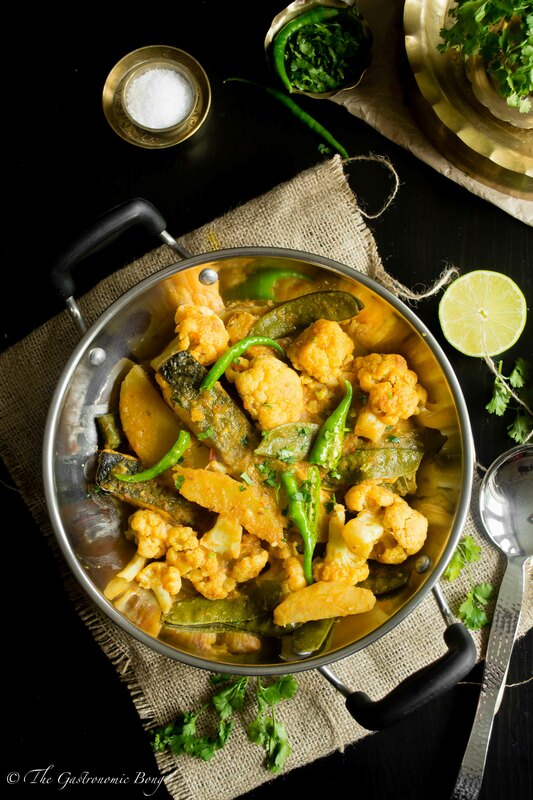 A light and soupy Salmon fish curry loaded with fresh veggies like cauliflower and potatoes and flavoured with warm and earthy spices like cumin and turmeric. Wash the fish fillets and marinate the fish with 1/2 tsp turmeric and 1/2 tsp salt and keep aside for 10- 15 mins. Heat a 2 tablespoon of oil in a pan and fry the fish on both the sides around 2-3 mins until its golden brown. In the same oil add the vegetables and fry till golden brown. Remove and set it aside. Add the remaining oil to the pan and temper it with cumin seeds, when it crackles add the onion-tomato paste and fry on low-medium heat until the raw smell disappears. Now add the turmeric, chilli and cumin powder and salt and continue to fry till the oil separates from the sides. Now add 2 cups of water. 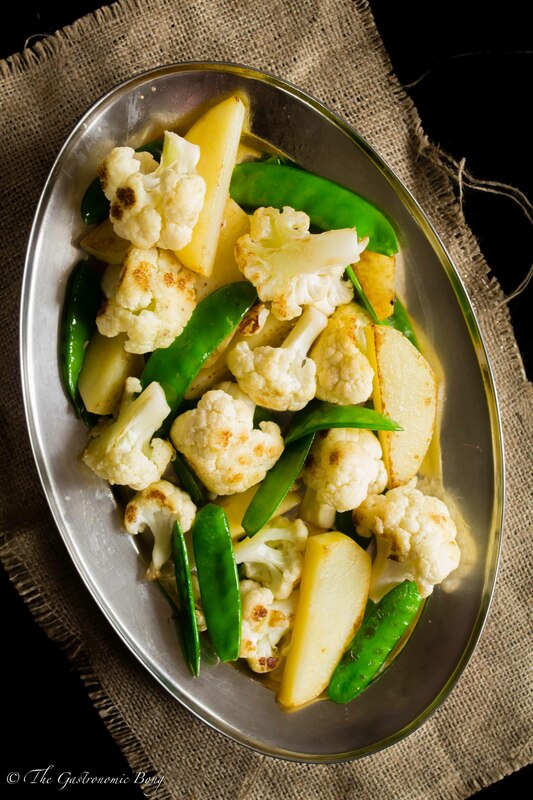 Toss in the fried vegetables along with the green chillies and mix everything well. Check the seasoning. Add more salt if required. Cover and bring it to a boil. Keep an eye on the vegetables. Once the veggies are cooked add the fried fish pieces. Cover and simmer for another 5 - 6 minutes. Add freshly chopped coriander in the end and let it sit for 2-3 minutes. I enjoy my Salmon Curry With Cauliflower And Potato (Fulkopi Aloo Diye Macher Jhol) with rice, a splash of lime and lots of freshly chopped coriander. This looks so great! I am always looking for new ways to prepare salmon! ugh! I LOVE curry! And I have all the ingredients to make this – yay! It’s meant to be! Pinning! I love salmon, we always pick some up when we get groceries! I’m always look for new ways to cook with it, so this sound fantastic. Totally delicious too! I know my husband would love this salmon dish! The spices sound absolutely lovely. YUM! I love this salmon dish! I love curry! You made everything so perfect! Lovely photos! I am definitely a fish lover! This sounds so delicious! Oh my goodness, this looks seriously amazing! Why have I never thought to put salmon in curry before? Arpita, I love salmon, curry and cauliflower!!! this dish looks so delicious and flavorful! I love all the spices and definitely want to give this curry a try!!! love! Salmon is my favorite fish, and I love how you’ve prepared it here with the curry and cauliflower! Massive fan of salmon curry, absolutely loving your recipe too. Had to google what Mangetouts are, might struggle to find them, but Im sure something similar exists in my neck of the woods. I’m a fish lover too and I definitely will have to try this!!!! 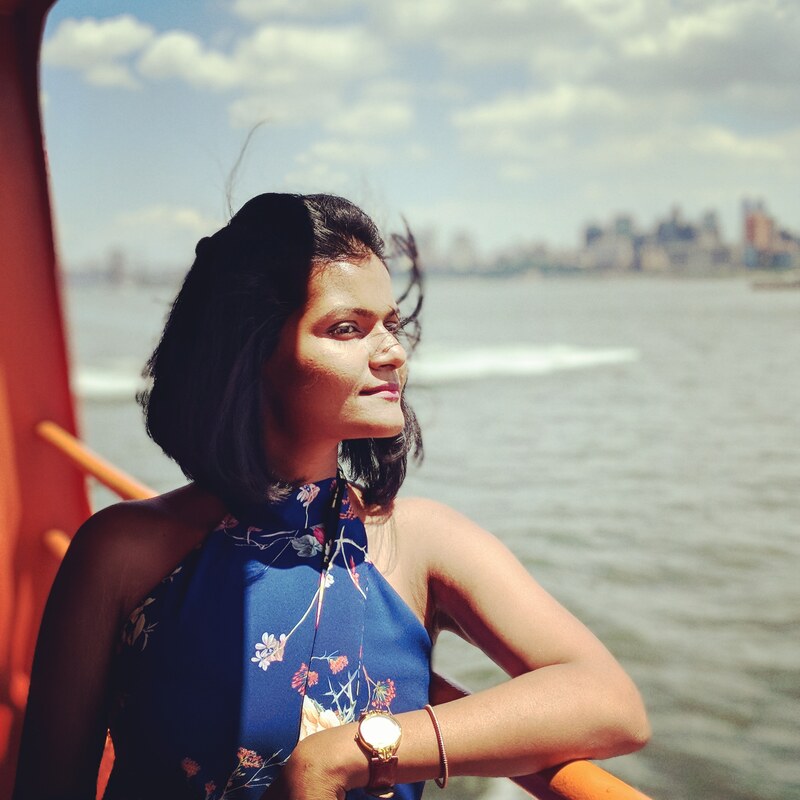 I’ve never tried salmon curry before, but it sounds delicious, Arpita! I love the flavors in here. This definitely looks like the perfect comfort food meal! Arpita, this is a gorgeous looking dish. I could totally go for this for dinner! I am like you, I LOVE fish and salmon is one of my favorites! This curry looks unbelievably yummy! Love all the scrumptious flavors, plus cauliflower and potatoes? Gimme allll this light, soupy, salmony deliciousness! Cheers, girl! I love salmon and I love curry. I never thought of putting the two together. This looks amazing! Now I wish I had this curry for lunch! Looks awesome! 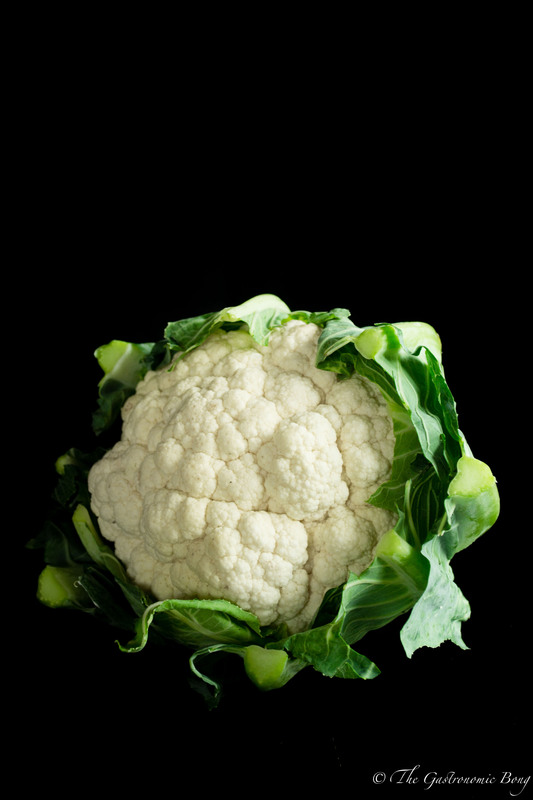 Love cauliflower! 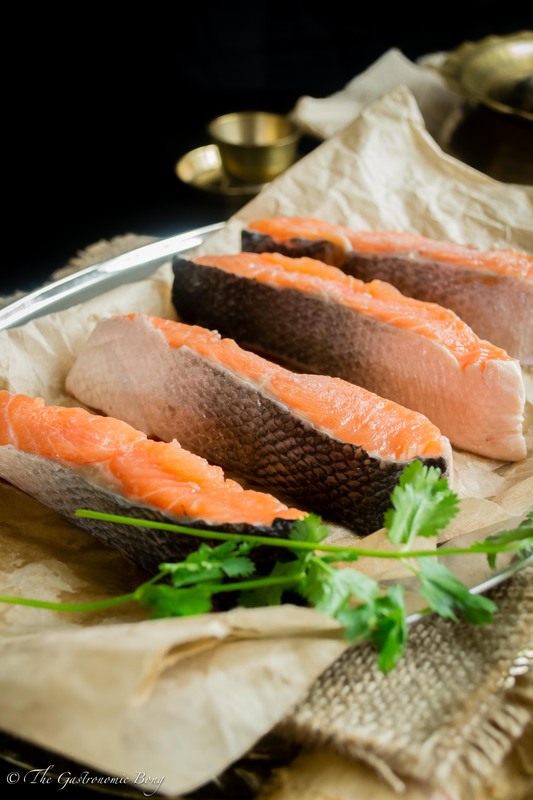 Salmon is our favorite fish and we are always looking for new ways to make it! Love how flavorful this curry is! So delish! Never thought of making salmon curry before. This dish looks very delicious and healthy at the same time. Thank you so much for sharing this lovely recipe.